More and more people have their own cell phones and would like to enjoy any movie/music on them. But cell phone prefers 3GP format much more which takes a little space and are very popular among cell phone users. Now I’d like to share a useful tool for all the people who want 3GP/MP3/AAC formats—4Easysoft 3GP Video Converter.It provdies an easiest way to convert any video to 3GP and enables you to put any video you like on BlackBerry, Motorola, LG, Sansung, Sony Ericsson, Nokia and other suchlike 3G mobile phones with high output quality and powerful editing functions. It is very easy to use. Just take the following steps you can finish your conversion. Step 1: Run this software and load your video/audio files. After you added the films, you can preview them in the preview window. Step 2: Select the output settings. You can choose the output format from the profile drop-down list. Click the “Browse” button, you can choose the output destination.If not, the default destination is D:\My Documents\4Easysoft Studio\Output. Step 3: Customize output settings. 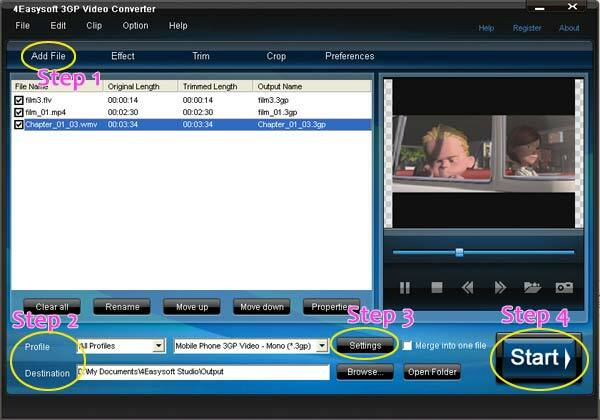 Click “Setting” button, you can choose the Resolution, Video Bitrate, Frame Rate, Audio Channels, Sample Rate, etc. Step 4:Click “Start” button to begin the conversion. 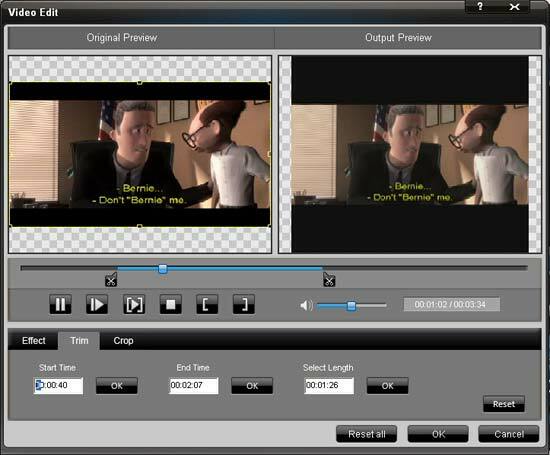 Click “Trim” button, you can split movies by presetting the exact start and end time, clicking the trim button or just dragging the slider bar. Click “Crop” buttom, you can crop frame size to suit mobile phone screen with this Video to 3GP Converter like smart scissors in 3 ways: selecting the crop mode, presenting the crop values, or dragging the crop frame. Select “Merge into one file” you can join your clips into one.4Easysoft 3GP Video Converter doubles your enjoyment with joining several interesting clips into one. 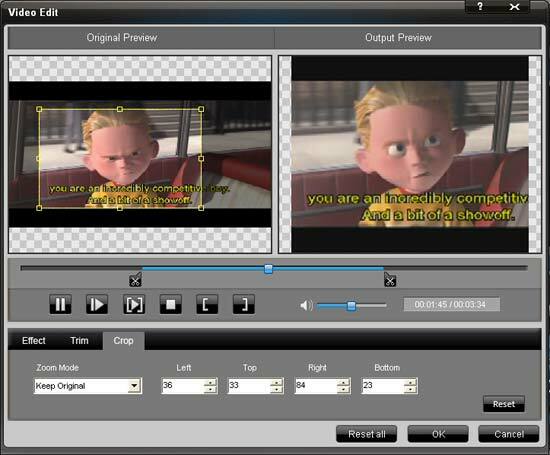 Capture the image of highlight while previewing movies. It can be saved in default folder automatically. Now just enjoy your cell phones and videos anywhere, anytime! 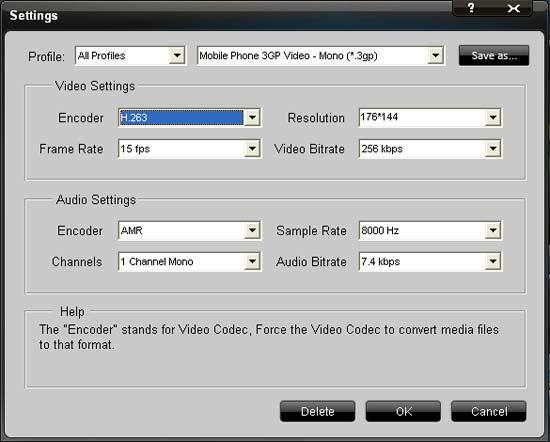 With all encoders/decoders built-in, 4Easysoft Cell Phone Video Converter can convert any video to cell phone and 4Easysoft Mobile Phone Video Converter provides perfect solution to convert your favorite video files for Mobile Phone with best quality of picture and sound.